The horseshoe is one of the world's most relied upon symbols of luck. 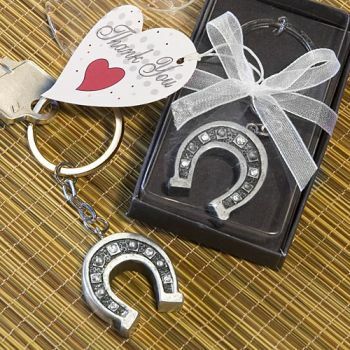 So give your guests some "good fortune to go" with these dazzling horseshoe key chain favors. Perfect for casino nights, retirement parties and almost any occasion where Lady Luck is on the guest list, each measures 3.5" x 0.25" x 1" with a metal key ring and chain attached to a resin pewter colored horseshoe charm lined with alternating rhinestones embedded at its center. Sold only by Fashioncraft, each comes packaged in a deluxe clear topped box with a black base, tied with a white ribbon and attached thank you tag.